As with many things in life, there are pitfalls on the way to becoming a true prepper- ready to be in control in any situation regardless of the emergency. While we notice many preppers are guilty of at least one of the cardinal sins below, (ourselves included!) we all can continuously strive to improve ourselves to make us stronger and better prepared. 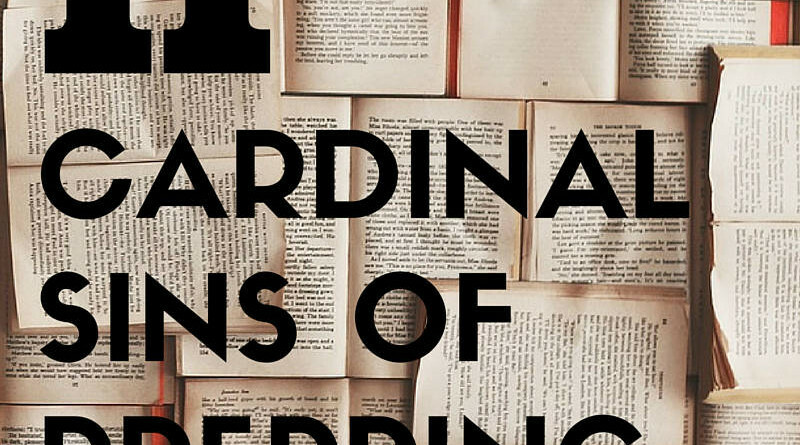 Identifying our weak areas and working to improve them is a lesson in itself, so take a look below and see if any of these cardinal sins apply. FIFO stands for “First In, First Out”, a method of storing supplies so the earlier items stored get used earlier. This prevents expiration and provides better command of inventory. An inventory list, like #5 talks about below, can help with this technique to ‘cycle’ through your inventory. While tools and gear are great, learned skills are where true preppers can excel in emergency scenarios, and even everyday life. Learning the basics, including creating fire, tying knots, and self defense not only allow you to be resourceful during emergencies, but each and every day. The list of learnable skills that apply to prepping is huge, and you should consider learning all of them. Buying gear and survival tools and never making time to learn how to use them can be a severe handicap in a SHTF scenario. While all gear is important to know how to use, it is especially important to be trained and knowledgeable on first aid and self defense equipment. It can become dangerous if you are using this equipment without proper training and understanding. An inventory of supplies is crucial to knowing exactly what you have and any expiration dates your supplies may have. This prevents your from storing expired food, having duplicate items, or having missed crucial parts of your kits. An inventory of your supplies allows you to easily critique your supply cache and gear, and allows you to share with trusted preppers for critique as well to get new ideas. Bug out or bug in? Be prepared for both. Many concentrate too hard on one area, limiting their options when the time comes to decide which to choose. Having a ‘tacticool’ bug out bag, but not even having 72 hour disaster supplies for your family is a large misappropriation of resources. Besides the flawed risk assessment used in that situation, the inability to bug in could be disastrous. Whether a threat or an asset, other people are usually present during a disaster or emergency. Prepping is not a game of solitaire; you will encounter people and need to interact with them. Do not underestimate people’s generosity, greed, or irrationality. You may encounter people willing to help you, hurt you, or who have no idea what they are doing. It is in your best interest to identify which category the fall into as quickly as possible. All the magazines, blogs, websites, and printed off guides cannot prepare you for disasters and emergencies. While these are great tools for staying educated, action is necessary to prepare and hone your resourcefulness. Practice your plans and use your gear- they are not relics to be kept in a case. Don’t get us wrong, picking up a copy of a prepping book or magazine and keeping up to date is great, just be sure that is not all you are doing. If you keep all of your preps in a single room in your house, and that specific room becomes unavailable to you during an emergency – what then? Dispersal of assets is not a new concept- the military uses this technique to minimize loss when attacks or emergencies are expected. It follows the old “don’t keep your eggs in one basket” phrase- you don’t want a single weak point where an attack or emergency can render your gear useless. Learn more at 3 Ways to Use Resource Dispersal to Improve Your Chances when SHTF. While being solidly confident is a great for a prepper, crossing the line into stubbornness can be dangerous. Being ‘set in your ways’ can be dangerous in an ever changing world where there are always new skills to learn. Staying informed, being open to changes and new ideas, and being adaptable is very important for survival.